Hometown Holidays is coming soon! Enjoy the Junction events while holiday shopping without the downtown hassle, and give your families an experience that could become a tradition. Mark your calendars for the schedule below! 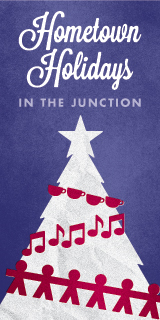 Skip the mall and come to The Junction! Photographer on site to take kids’ pictures. Bring your camera and kiddo’s to meet Santa. Carolers, cocoa, and community tree! Unique holiday gifts and a night on the town. Let Belgium Draft Mules lead the way.